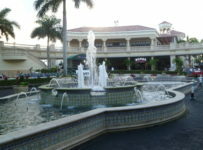 The Gulfstream Park West thoroughbred race meet will open Saturday at Calder Casino in Miami Gardens, Fla. First post is 1:15 p.m. for the 10-race opening day card. The GP West meet will have ten races this Sunday and ten races this Monday. First post is 1:15 p.m. each day. Mondays will usually be dark during the GP West meet. The racing card for this Monday Oct. 10 (Veterans Day) was part of the original schedule. Gulfstream Park is running the GP West meet for the third straight year under a lease agreement with Calder. The meet will have 40 race days, mostly Wednesdays through Sundays, and extend through Nov. 27. Gulfstream is asking fans to not go to Calder, but instead go to its track in Hallandale Beach, Fla., where via simulcast they can watch and wager on the GP West races. Gulfstream has been reminding fans that there will be only limited amenities at Calder. Calder is in the lengthy process of tearing down its seven-story grandstand building. Thus, most of the previous area for fans is off-limits due to safety concerns. Fans will be able to watch races near the rail. But there will be no tents or other covered structures for the public. *There will be no teller stations with mutuel clerks. *There will be approximately a half-dozen betting machines. 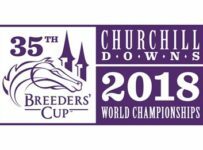 * There will be two walk-around mutuel clerks, who can cash tickets they sell and cash tickets bought at machines in the racing area and in Calder’s casino. Winning tickets purchased at Calder can be cashed at Gulfstream, under the regular 12-month deadline. *There will be a large TV in the racing area, showing the GP West races. There will not be any other TVs around the racing area. * Calder has agreed to open to the public a small restroom building (now used by workers) near the still-intact saddling area. * During most of the race day, a food truck is parked in an area that is near the jockeys’ building and accessible to the public. Food also can be purchased from the kitchen in the jockeys’ room. Refreshments also are available in the casino. *There will be a tent for trainers and owners. Calder will have a small to-be-determined number of betting machines in its casino building, several hundred yards west of the finish line. 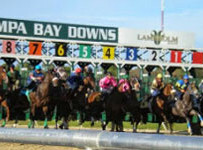 The casino will have several TVs showing the GP West races and between-races telecasts. There will be no in-bound simulcasts of races from other tracks at Calder. The two simulcast rooms on Gulfstream’s ground floor will be open seven days a week and will have Gulfstream’s regular simulcast tracks.